DongGuan Hong Cheng Optical Products Co., Ltd. 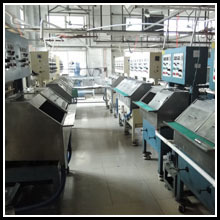 Specializes in the production of optical products. With creative and innovative spirits, we produce the following products: zoom lens, grating ruler and DRO, stage micrometer, Standard Glass Scale, Machine Vision Calibration Target, Standard Glass , spherical glass lens, optical prism, Reticle Glass, Optical resolution test board, Workbench Glass and Optical Flat etc. , Hong Cheng optical always adhere to the principle of "pursuit of quality, honesty and realism”. Except the pursuit of business development, at the same time , we pay much attention to enterprise management and after -sale services. And with good quality and service we have won many clients of home and abroad. The company is the permanent company of China Measurement Institute and has the corporation with China Institute of Metrology, Southern China Metrology Institute,Changchun Institute of Optics and Fine Mechanics ( Chinese Academy of Sciences Changchun Optical Precision Machine Mechanical and Physical Research Institute) and a number of enterprises and institutions. Based on the optical and measurement industry,abided by the aim of “quality first, customer first, credit foremost” .We will be on the way of “mass production, famous brand, grouped company, business with the whole world”.